Sablefish (a.k.a. Black Cod) marinated in a sweet miso glaze. Popularized by Nobu, this is a simpler take on the restaurant favorite. Popularized by Nobu Matsuhisa in his eponymous restaurant, Black Cod with Miso has become an instant classic associated with Japanese food. The irony is that black cod (or more accurately Sablefish), is not native to the waters around Japan and is imported from the US and Canada. In Japanese cuisine, “gindara” (銀鱈) or silver cod, is often prepared as kasuzuke and grilled. 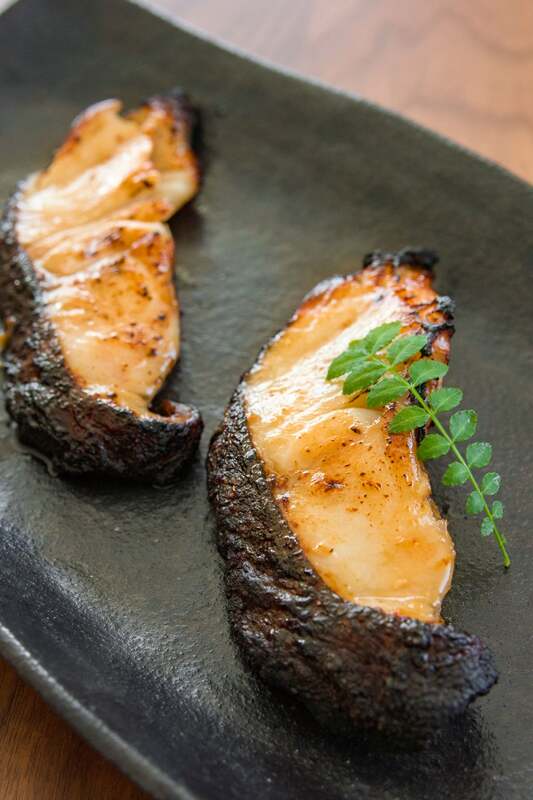 Marinated for a few days in sakekasu (the lees leftover from the production of sake), the fish takes on a marvelous earthy flavor that compliments the rich creamy texture of the sablefish. The trouble is that it’s almost impossible to find sakekasu in the US, which is probably one of the reasons why Nobu chose to use miso instead. While both suffer from a case of mistaken identity, and have a similar texture, there is one important distinction between the two. Patagonian Toothfish is overfished and not sustainable because of its lifecycle, as well as how it’s typically caught. Sablefish on the other hand earns a FSSI (Fish Stock Sustainability Index) of 4 (the best possible rating) from the NOAA, making it an excellent alternative. To make the ginger juice, just grate the ginger into a bowl and squeeze the pulp to get the juice. Put the miso, mirin, sugar and ginger juice into a Ziploc bag and swish it around to combine. Add the sablefish to the bag and move the fish around to coat evenly. Press out as much air from the bag as you can (I usually set the bag on the countertop, partially seal the bag, then press out the air before sealing it all the way). This helps the marinade surround the fish. 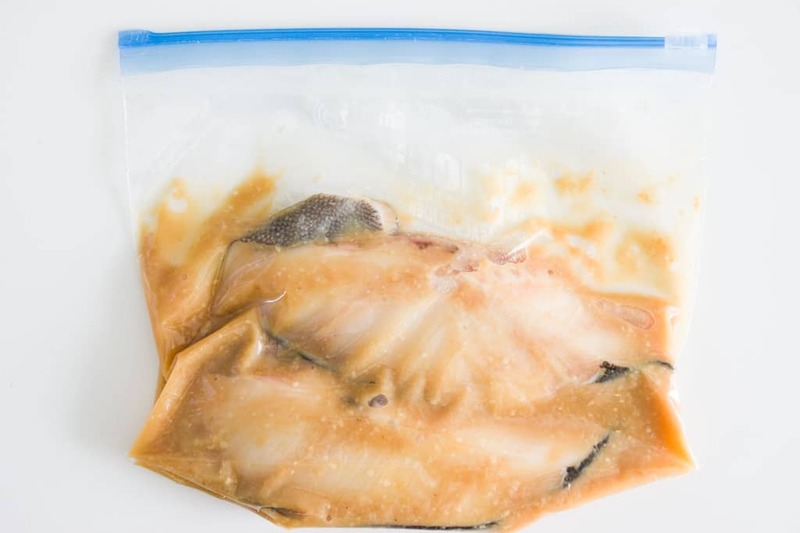 Put the bag in the fridge and marinate for at least 8 hours or up to 2 days. When you're ready to grill it, move your oven rack to the upper middle position and preheat your broiler for about 5 minutes. Oil a wire rack with a paper towel and vegetable oil, then place it over a baking sheet. Scape the excess marinade off each fillet with your fingers, and then place the sablefish on the rack. Put the sheet in the oven and grill until golden brown, and the meat flakes easily. Serve the miso glazed cod with steamed rice. i appreciate how simple the marinade is & yet how much it brings to the dish. ive never heard of natto but now i'm curious…if i manage to find it i'd love to give it a try! For some reason, the name of this dish sounds really familiar – is it because it sounds like an instant classic? I'll try anything once, including natto, but I haven't seen it before. And I insist that it must be served as elegantly as this.Happy birthday Marc! Quite often, fish and seafood need little adornment…just complement the flavour of the main ingredient (cod). This is my favourite fish dish! Made this the other time and it was TO.DIE.FOR, am so glad you featured it! There is a Japanese market I sometimes go to, I'll have to check next time if they have natto, it's something I've been hearing a lot about lately. Any other suggestions for how to use it? 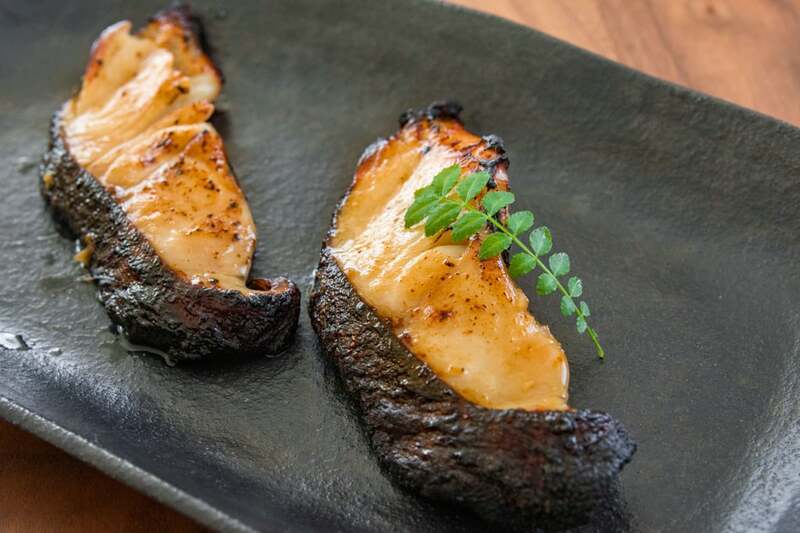 Love miso black cod – I think I've only had it once, at Nobu I believe. Definitely something I want to try at home. I've only tried natto once – we bought some in a supermarket while I was in Japan. *definitely* an acquired taste! I did not like it, and haven't tried it since (that was 12 years ago!) . . . maybe my palate has grown and it's worth trying again! Black cod is, by far, my favorite fish. And I've been wild about miso glazes for seafood ever since I tried a recipe for miso-glazed salmon. Reminds me that it's about time we hauled out the grill again! Black cod is such a lovely thing. I recently had the black cod at nobu for the first time, and I'm remembering the flavors and the crisp skin while looking at your photo. The marinade sounds great! Here, it's usually called Butterfish, and what an excellent way of preparing it. Can you suggest some alternate for the natto? Maybe some grated pecorino? Is this your birthday dinner? It's beautiful! I'm not as familiar with miso as I would like to be, but I did just purchase some red miso paste to use as a marinade. Would red miso paste work for this recipe or would it be too strong? I LOVE red miso, I like both really, LOVE the photography… I am having issues with lighting.. any tips? Hi Marc. Any recommendations on a natto replacement? I was thinking potatoes cubed tiny. Hello marc,What a superb looking fish dish! !MMMMMMMMMMMM,….lovely food! I have to warn you that many Japanese people won't even touch it (it'srealllly slimy and stinky). That said, for me there's nothing betterthan a tub of whipped natto flavoured with some dashi soy sauce (it'sso sticky you can get a nice froth going) over a bowl of hot rice.Adding minced green onions cuts through some of the smell. There are lots of Japanese people that don't even like it, so I can'tblame you. If you want to ease into it (and are okay with the slimytexture), try adding minced green onion. It also helps to buy a brandwith a good sauce packet (plain soy sauce isn't as good as the onesthat come with dashi flavoured soy sauce). Honestly, the broccoli rabe and garlic go beautifully together. Thatsaid if you want that nuttiness, percorino sounds like a great choice. Nope, just a quick weeknight thing:-) The cod was on sale, and if youhave the fish marinated it comes together in about 10 minutes. Red miso tends to be saltier, so you may need to increase the amountof sugar a little to compensate. Otherwise it should work just fine. Daylight is always best, but I use a cheap Ikea lamp with a rice papershade and a 40w compact fluorescent bulb that's daylight coloured.Then to get rid of the shadows, I have someone hold a piece of whitefoamcore board opposite the lamp to reflect some light on the otherside. Email me if you need more specific. Now I feel guilty, Whole Foods many years ago would not sell chilean sea bass because of sustainability, and now you see it here and there, even WF, so I bought it, but I wonder…Love your dish, and I loved making Miso marinade, my beginning journey into my Asian cooking! Miso marinade for my sea bass is the beginning journey into Asian recipes I had not tried before…WF quite selling certain fish years ago when I lived in Dallas, and now I feel guilty buying my main ingredient without really knowing!Yours looks gorgeous as usual! The sea bass they sell at WF is MSC certified. But the problem with itis that it has an unusually high mercury content. I'm totally into this. Also, I love the black cod they sell that has been marinated in that sake sediment. Forgetting the name, not the sublime flavor. Sake kasu:-) I love it too! Natto…the first time I tried it was in Hawaii, and let's just say it took many mouthfuls of gohan to smother the taste! But this misoyaki cod would require no such dilution. Gorgeous. Beautiful crispy skin— this fish is exactly what I like to have for dinner! I love this style of cooking and I love cod fish. 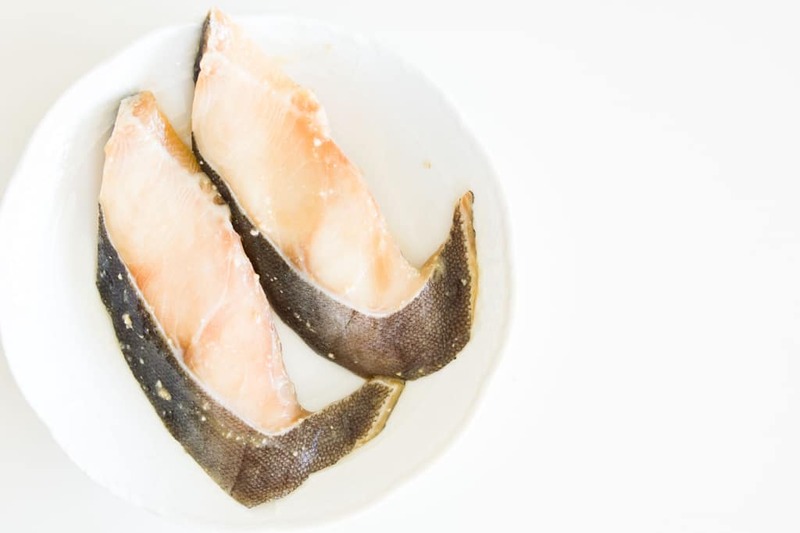 I've always felt guilty eating it as I knew it was not sustainable but knowing that black cod is – well this is the best news I've heard today!Thanks! Gorgeous dish. Simple yet sublime. Mmmm…I'm reading this before breakfast and I actually want to chow down on that right now! I love how the bass is teetering on the gorgeous mound of rabe. Adding it to my shopping list! First time to this blog. Got stumbled here while I was searching for a recipe for black cod fish. I must say, your blog has georgeous photos and I'm loving how you present your recipes here. And this dish is just so perfect for my menu plan for the coming Holy Week. I’ll be sure to come back to your blog often. ahhhh… love this dish. it's the dish that put nobu on the culinary map and one of the things that made Nobu Matsuhisa famous. look at that skin, marc. damn. sustainable to boot. We have a holiday weekend come up this weekend. Also my sons birthday, I was looking for something perfect for my menu plan and this looks amazing. We tried your recipe today, and it’s a big hit! I did this at the last minute without having the time to marinate the fish overnight, but it tasted delicious regardless, with the sauce I made with the scraped-off miso paste and the juice from the fish itself. I bet it will be even more delicious next time when it’s marinated. Like you said, this recipe works better than the usual soy marinade. Thank you for sharing! I always find the different names for fish very confusing. Who knew that black cod wasn’t even a cod? Not sure if we have anything similar here in New Zealand as we don’t even have Chilean Sea Bass. Any oily flaky white-meat fish will work, so if you can’t find sablefish, try it with something else. Thanks for the explanation. No wonder the cod I buy from the grocer tastes different! My favourite way of cooking fish! Just blogged about this not long ago, but I couldn’t find black cod so I just used the regular ones. Also used the same marinade on Salmon, worked well too. Found Black Cod at Fresh Foods, it is in season now!